Join the biggest bachata festival in Kos, Greece! 4 Days of unlimited dancing and unforgettable moments!! The event includes Bachata, kizomba, zouk and salsa workshops. Over 50 hours of world classworkshops, Master classes, live concert by Dustin Ritchie and his band, Boat parties, dance marathons, Pool parties, Beach party, Competitions, Over 20 Showsand many more surprises!! This pass includes all the benefits of the full pass plus a lot more advantages. With the VIP pass you can have access to our SBK marathon on Thursday!! The SBK marathon includes a boat party, a beach party on a different island in the heart of Aegean, a second boat party on our way back to Kos and a night party at the main hotel until Friday morning!! Also, the VIP pass holders will have front row seats to watch all the world class shows and competitions. On the registration there will be a Bachata King or Queen t-shirt with your name waiting for you. And there’s more… With the VIP pass you will be able to enter our masterclasses by Mauricio and Simona, Dario and Sara. This pass includes all workshops, pool parties, night parties from Thursday 26/09 to Sunday 29/09 The full pass includes also entry to all the shows, competitions AND THE HUGE CONCERT BY DUSTIN RICHIE!!! This pass includes entry to all the workshops, pool parties, shows, night parties and any other activities taking place on the day. This pass includes entry to all the parties from Thursday 26/09 to Sunday 29/09 (Thusday boat parties and beach party are not included here). 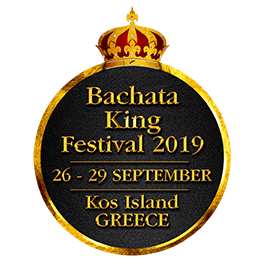 © 2019 bachata-king-festival.com. All rights reserved.